Abu Dhabi is the capital of an Emirate by the same name in the small Arabian Peninsula country of the United Arab Emirates. Yes, it’s surrounded by the Persian Gulf on one side and vast desert on all others, seared by the Arabian climate, and subject to an intimidating thing called Sharia Law, but it has its oddly Western moments — a strange cross-section of the ancient Middle East and a modern global city flaunting ambitious skyscrapers, a burgeoning global art scene, and rapidly developing infrastructure. A dear friend recently relocated there from Brooklyn for a job in the art department at Abu Dhabi’s new NYU campus, and thanks to a virtually-free stopover on Etihad Airways, I spent ten days with her in March, soaking up her new version of everyday life. We made the 45-minute drive to Dubai, but spent most of our time tooling around her Emirate, from the public beaches and luxury hotels, to the far reaches inland, in the endless stretches of dunes along the border of Oman. Should you ever find yourself in Abu Dhabi, here are 11 things we recommend. At the start of the Corniche, the walkway that winds along the beach edge of the city, sits the Emirates Palace, the pinnacle of hospitality in Abu Dhabi since 2005. In fact, with a price tag of $3 billion USD, it was the second most expensive hotel in the world to construct. 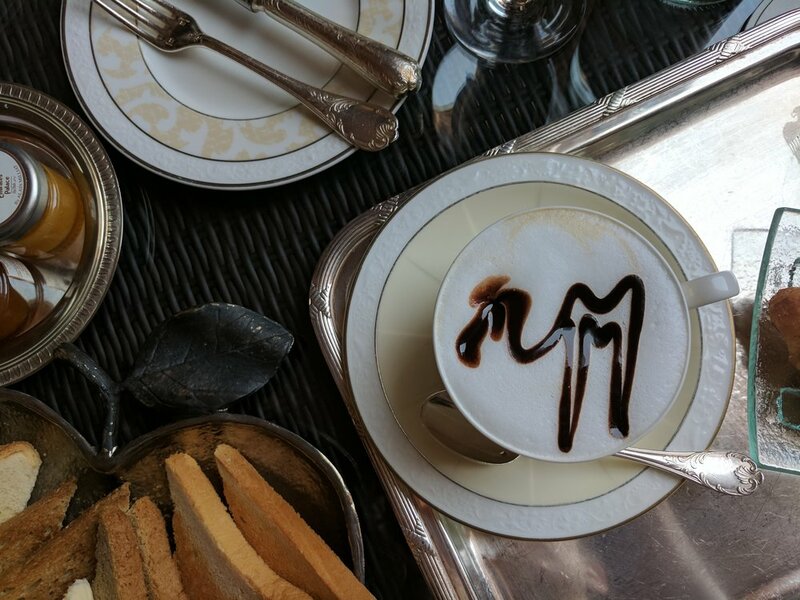 Coffee here will cost a bit more than the average cup, however the lobby’s opulent dome and view of private beaches and gardens will have you feeling like a million bucks. Pop in for glamorous breakfast and admire the tapestries, fountains, and indoor palm trees from your perch on the balcony. For a truly decadent breakfast, order up a latte with gold stirred into it, or a “camelccino” made with guess what kind of milk. This sounds like fairly universal advice, but happy hour in Abu Dhabi is different! The bars are usually located inside five-star hotels, making happy hour a particularly posh affair. The tourism industry has the market cornered on liquor licenses since most Emiratis abstain from drinking under Sharia Law. These hotel bars offer exceptional happy hour deals. A rotating ladies’ night means that ladies can drink for free every night of the week if they find the right combination of spots, an easy task with the help of an app called The Entertainer. Particular finds via The Entertainer included two-for-one Camel Burgers at the Manarat Al Saadiyat’s Fanr Restaurant, buy-one-get-one entrées at the Rosewood’s Dai Pai Dong, and two-for-one cocktails before 7 p.m. at the Manhattan Lounge in Saadiyat’s St. Regis. The St. Regis is a destination unto itself as it offers a columned, airy, marble balcony looks out over a stunning palm grove between this luxury hotel and the sea. Benches, boats, cyclists, joggers, families making their way to the public beaches, or brunchers pouring out of Asia de Cuba or any number of fabulous restaurants and bars along this stretch make this a quintessential stroll. The Corniche is the most happening artery of the city, where Emirati residents are seen strolling alongside their foreigner neighbors. Go early in the day to before the searing Arabian sun becomes too strong — perhaps right after that camelccino. Believe it or not, Abu Dhabi is a beach town. Saadiyat Island’s public beach is a couple bucks admission for the day. Rent a chair, grab an ice cream at the kiosk, and soak up the rays along the Persian Gulf. For a more urban version of this experience visit the Public Beaches along the Corniche, but don’t be surprised if half the entrances are under construction. Masdar City brings to mind something straight out of LOST. Think Dharma Initiative HQ: sci-fi buildings, innovative architecture designed for cooling a desert city, an electric car testing track. It’s poised to be a sustainable, utopian residential development in addition to a research center where scientists from around the world pilot sustainability-related developments. At the moment, it’s still far from being “complete” and it may be challenging to find your way through the construction sites from the parking lot to the main entrance. Abu Dhabi is full of art museums and galleries. Satellites of the Guggenheim and the Louvre are on the brink of opening later this year. Manarat Al Saadiyat has four galleries and rotating special exhibitions in addition to the permanent collection. Film screenings are also on offer. New York University’s nearby campus also has its own gallery curated by members of the university community. For something more off-the-beaten-path, venture to Warehouse 421 in the Warehouse District for a new cultural destination that has more than just “exhibitions” but also offers workshops, lectures and interactive galleries. Spend a couple hours in the medical and rehabilitation facilities where sheiks bring their falcons for emergency surgery as well as feather repair, known as “imping”, talon-trimming, and other routine bird-of-prey primping. The $45 USD admission also lets visitors hold a falcon. 8. Roadtrip to the camel souk in Al Ain. Al Ain, just under two hours inland, is the other “big city” in the emirate of Abu Dhabi, not to mention one of the world’s oldest permanently inhabited settlements, and a UNESCO World Heritage Site. Have a glance eastward out of the car window on the drive in for a look at the mountainous Omani border. One of Al Ain’s oddities tucked away (behind a mall) is the camel souk, where men play cards and smoke cigarettes in the sparse grassy areas along the parking lot and deal camels to visitors in the market for an even-toed ungulate. To make a blanket statement, Abu Dhabi is under construction. It’s said to have the most construction cranes in the world. Your GPS may well send you to gas stations that are so new they’re still weeks from opening. As new highways shift and expand, old roads are cut off, rendering maps obsolete. The burgeoning construction also makes it difficult for locals to provide reliable directions. Research your route a couple ways before setting out on an adventure, and maintain calm if you hit a dead end — you may see some of the best and most surreal sites that way. While cooking dinner over a bonfire in a haboob (sandstorm) without getting sand in your teeth is a skill honed over generations, don’t miss a chance to sleep, or at least tromp around, in the Empty Quarter — the world’s largest contiguous expanse of sand. You might recognize it as Jakku minus the junker starships, from the latest Star Wars. Don’t forget your stash of water. The amenities here are few and far between. Protip: Make sure you have four-wheel drive to make your way down the perfect side road until you find a good place to park… unless you trust that a friendly Omani farmer will help you dig your wheels out. Do not bring alcohol to the campsite. Drinking in the UAE is technically illegal under Sharia Law. Check out the times for calls to prayer at the Sheikh Zayed Grand Mosque online before you visit if you want to time your visit to catch both the evening songs, which depending on the time of year take place at 7:00pm and again at 8:30pm. The experience of listening to the muezzin’s prayer song echo through the vast arena of the marble and mother-of-pearl courtyard is cathartic. Don’t miss a chance to slip off your shoes, step inside, and ogle the opulence, from the world’s largest carpet (over 60,000 square feet and 35 tons of hand-knotted wool) to the world’s third largest chandelier, all comprised of Swarovski crystal. Pro-tip: You’ll need to cover your ankles, wrists and head – If you turn up without proper attire, you’ll end up wearing a loaner. They hand out robes at the ladies’ entrance. Have you ever been to Abu Dhabi, what were your favorite things to do in Abu Dhabi? Comment below! Alexandra Mavar is a contributor. Go to her site for more alexmarvar.com and follow her on Instagram: @hollowwalls and on Twitter: @cannoneyes. Love this! Great photos too.